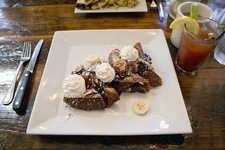 I just moved to Schenectady, and I'm wondering if anyone has good recommendations for brunch spots (especially those with bars) for Saturday/Sunday mornings. I've tried Union Cafe, which has fantastic service, darn good pancakes, and tasty Greek eats. Eating on the patio in the sun is nice (although the view leaves something to be desired), and there is no alcohol served (i.e., cravings for a bloody mary or mimosa go un-quenched). Any tips from the AOA community would be greatly appreciated. Lindsay mentions that she's been following Lauren's brunch mini-tour. But that hasn't made it to Schenectady, yet. So if you have suggestions for Lindsay, they can also double has possible spots for Lauren to check out. So, got a good place in mind? Please share. And, as always, a sentence or two about why you're suggesting that place is like an extra kick of horseradish in the Bloody Mary. I'm a big fan of Ambition on Jay Street. Great brunch menu (I recommend the gringo omelet made with salsa and chorizo) and they have fantastic bloody marys. They also serve mimosas although I have not tried one, but like everything else at Ambition I assume they're pretty awesome. If you like a hearty, home-made breakfast go to Oliver's in Glenville or Scotia Diner. There is Ambition CafÃ© on Jay Street which is decent and has alcohol service. There is also CafÃ© Tesoros which is on Union Street and is Spanish. Both have great coffee and food. There is Stockade Inn and Glen Sanders Mansion. Pricey but good alcohol. Perreca's in Little Italy is fantastic, and Tesoro's Cafe on Union St is nice - not sure if either serve alcohol though. The Stockade Inn used to serve a great brunch. Glen Sanders Mansion, although just over the bridge to Scotia, also has brunch every Sunday. If you're looking for something more casual, Tops in Rotterdam has more of an upscale diner theme but also has a bar. Hope this was helpful. Great to read you recently moved to Schenectady. I hope you love my City as much as I do! Oddly, getting brunch and alcohol in the schenectady area is difficult. One place is Ambition on Jay St. but the view isn't really spectacular and from my last memory of being there, it felt really tiny & dark inside but i've never had a bad experience there. Schenectady has great diners. So brunch without booze is doable. The Point is small and verges into the Rotterdam side of Schenectady but the food is great. Oliver's Cafe which verges towards the Scotia side of Schenectady is also super also Mike's Diner near Guilderland. Perreca's is awesome the eggs in purgatory is in my humble option one of the best if not the best in the capital district. And the do serve beer and wine. Hope you enjoy this lovely, historic town. Make sure to check in to see what the Community Land Trust of Schenectady is up to. Because good community means good brunch restaurants! Without a doubt, get the "Eggs in Purgatory" at Perecca's. It's the only answer. The first person to open up a Cafe Madison, or City Beer Hall type brunch place in Schenectady is going to make a fortune. It's only a matter of time. Conversely, if Wolff's Schenectady ever expands it's kitchen, they can do the type of brunch they serve in Albany. Tesoro's is amazing!! I happened by there randomly one morning and was totally blown away. Mmmmmm. Lots of brunch options- frittatas, omelets and crepes, and menu items with a Spanish flare. We've lived in Schenectady for the past year and are happily moving to Columbia County soon. When we want to go out for a good breakfast, we drive to Albany and go to Madison Cafe. We tried breakfast the Stockade Inn and more Perreca's and were displeased with the food and prices at both (although the Stockade Inn is really nice otherwise). I will recommend the Van Dyke, Tara's Kitchen and Johnny's for meals other than breakfast. If you are looking for a trendy brunch place downtown with a good bloody mary that is always packed on the weekend like in Brooklyn or like Iron Gate in Albany, i'd say good luck. Ambition is probably the closest we get. I have lived in Schenectady for 6 years and this has always bummed me out, we are seriously missing a great brunch spot. Diners are fine and we have tons of them but not what I think you are looking for. We usually hit Ambition, Union Cafe, Olivers, the only one downtown is Ambition. i had a really good brunch at Mexican Radio a few months ago. I haven't really loved them for dinner but the brunch was excellent. There is definitely alcohol.